Momma Jorje: More Embarrassing than Lice?? What could possibly be more embarrassing than head lice?! Oh, just you wait! My teen daughter was broken out in... bites! Tons of bites ALL over. I checked her room / bed and didn't find anything. We went to the doctor and got pills for her to take for whatever outbreak it was. Soon after, she was laying in her bed and saw one... a bug. She Googled it and quickly found a match. She had bed bugs! I researched the crap out of the topic! I read about treatment options, local laws, etc. Our property managers are not required by law to treat. I also didn't want chemicals in my home. I found that even our city page offered Diatomaceous Earth as a viable home treatment option. I happened to have some on-hand! So we started with sprinkling known infestation areas, putting a heavy line of it between rooms and then just a light sprinkling on the carpet throughout the house. We tried to vacuum daily. That can be quite a task! They can live in your clothing (in your closet and while wearing them!). Guests can pick up bed bugs from your home and take them elsewhere. Treating with something like Diatomaceous Earth can cause bed bugs to scatter, essentially making things worse for a while. DE works by dehydrating the bugs, so it takes at least 2 weeks to start working. 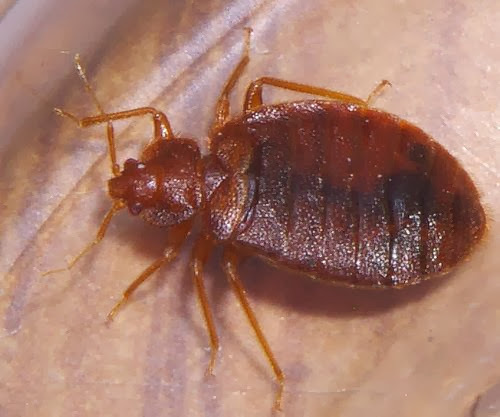 Bed bug bites may not show up for 24 hours. I'm told it can take up to 2 weeks! You can manually check daily for bed bugs and never see a single bug! Bed bugs will not move through a wall as long as there is food in the room. You can see your blood inside the bugs! They're near impossible to crush, much like fleas. and lice. Heat in excess of 120° will kill bed bugs. I didn't know all of those things at first. While treating, we moved Tyler into Sasha's room and Sasha into our room. Double whammy for encouraging the bugs to spread. We'd already been finding mysterious bites on the rest of us. We had ditched Tyler's mattress, our couch and our futon. Then our bean bag. Soon after moving the kids around, we started actually seeing bugs in other rooms of the house. I kept debating whether to notify the management office of our complex. Our local laws do *not* require landlords to treat an occupied property for bed bugs. I also didn't want my home filled with nasty chemicals. The bites got worse. Tyler was so stressed about trying to sleep. One night she came downstairs and absolutely fell part. She said sometimes she wished I wasn't such a hippie so that I would get an exterminator. It broke my heart. I felt horrible. The very next morning, I contacted the office to get the ball rolling. It took several more calls before they finally got the inspector from the extermination company out to see our place. They guy was SO nice! He was very patient with our kids and with my questions. He was just an awesome face to put on a business! He told me how they treat with HEAT (what?! no chemicals??). Treatment costs $1100 because of the $100K machine they bring out, but our complex pays for ONE treatment. I was thrilled, but also felt even worse about putting off getting help. Sasha was turning up with more and more bites, but we weren't sure where she was getting them. We had found bugs in every carpeted room except our bedroom at that point. The night before our scheduled treatment, as I tucked her into her palette next to our bed, I found them... right next to where she was sleeping. And there was... just... nothing I could do. It broke my heart to put her to bed knowing she'd just get eaten more. Finally, the day of treatment! I had to pack up certain heat-sensitive items (like putting all chocolate and crayons into the fridge). I did most of the prep work the night before. The exterminators arrived at 9ish. We had to be out of the house for 7-8 hours. Trying to find free / cheap things to do all day... whew! We used some coupons left from the Summer Reading Program, took the kids to play at McDonald's, for free cookies at a local bakery, and to a local children's museum (worth the money that cost). We spent 3 hours at Discovery Lab. This is the slide at the end of a tunnel... made of... TAPE. When we arrived home, the exterminators had left our door unlocked! The temperature upstairs was about 93° F. Crazy. We opened windows to let the house cool down and I started putting our home back together. I had been warned they would take things out of closets, etc. It wasn't bad. These dead bugs were right next to where Sasha had been sleeping. I vacuumed. I made beds. As I went to close windows... I found a bug. Alive. Oh dear. OK, maybe a fluke, right? Except we found another the next day. Then we found a few. I called the office to report it. After all, I didn't want and could not pay for another treatment myself! It took weeks to get connected for another "inspection!" The inspector came out and didn't inspect at all. He basically explained that they knew, with an infestation as bad as ours, that a second treatment would be necessary, but they don't like to open with that. What?! At the very least, we could have scheduled a follow-up inspection ahead of time! During this wait, we received an amazing gift. Some dear friends had taken up a collection amongst themselves. 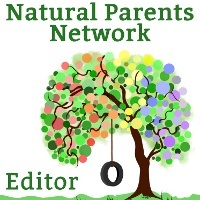 I'd like to remind everyone again, that volunteering for Natural Parents Network is wonderful. Its been the most supportive mom community with which I have ever been involved! So these fine women knew that my family would have mattresses to replace. I took the money they sent to me to a small furniture shop I know. I've always been happy with mattresses on the floor... until bed bugs. I was able to take their "investment" and purchase: a bed frame for Tyler, a bunk bed frame for Sasha, mattresses for the bunk bed and a frame for our bed! They also gave me a palette to use the boards for Tyler's bed. I knew it would be safe to bring these into our home because they would be treated. I would like to take this opportunity to thank my friends Amy, Ana, Charise, Dionna, Emily, Erica, Gretchen, Jennifer, Julia, Kellie, Kelly, Kristin, Lauren, Luschka, Lyndsay, Mandy, and Shannon so much for their generosity and the difference they made for our family! By the time we actually got our second treatment, five weeks had gone by (since the first treatment)! Yes, my children were still being eaten. Spencer was getting eaten, sleeping in a Pack 'n Play bunk. I kept checking around the bunk, under the mat, nothing! It wasn't until after the second treatment that I found evidence of them, under the mobile attachment. The worst nest of them was in the top of Tyler's window! So... checking your bed doesn't even begin to cover it! For this second treatment, they took at least 8 hours. They thoroughly trashed our entire house (closets, drawers, tent bags and more - all emptied, keepsakes box strewn about, items thrown around and stepped on). It was 108° F upstairs when I got home. (We were glad it wasn't Winter!) They also used chemicals in addition to the heat. Without asking me. Mind you, as long as we're free of the bugs, I think it was probably worth the chemical exposure. But when I arrived home to try to put it back together, I had a bit of an anxiety attack. Furniture was moved. There was crap everywhere, including push pins on the floor! I could not put Spencer down anywhere. But its behind us, right? As of this post, it has been 3 weeks since our last treatment. We found 1 bug the night we got home, but nothing since... until yesterday. I found a single bed bug, on its back, in the middle of my desk top. I have no idea what it means, but I have to hope that it is a fluke. We haven't been able to have company in months and my children are still healing from all of their bites. I would not wish this on an enemy. It has been a horrid experience and one part of why I call our 2013: The Year of the Parasites. We had bed bugs for well over 3 months! You have completely terrified me now. Lol I have always thought lice was about the worst thing ever, and I am very paranoid about lice and lice prevention, but I definitely now think that bed bugs would be much worse. Thank you for writing about something like this! It obviously happens to people, but most people are too ashamed or embarrassed to talk about it. I think it's important to take the stigma away from these things so we can all be better informed. We had bed bugs a year and a half ago, and it was the worst experience of my life. We did manage to get rid of them using DE though. The trick is to treat the entire house at the same time. I would also get rid of any mattresses, and launder all clothing and soft materials in extremely hot water, and dry on the hottest setting. If you can't put it in a washer than get rid of it. Basically, strip your house, then sprinkle the DE over all the carpets and in any cracks or corners. Wash all hard surfaces (shelves in closets, walls, ect) with extremely hot water, then wash them with rubbing alcohol. What the exterminator apparently didn't tell you is that you will have to re-treat in a month or so when their eggs hatch, because the heat won't kill that. Also, your apartment manager should warn the rest of the complex since the bedbugs can move through any crack in the wall, and will do that to escape the heat and chemicals. The safest thing to do is treat the entire complex all at once. Maybe that sounds dramatic, but I would much rather be safe than sorry personally. I'm now so paranoid about the things. I know I said it before, but it was such a horrible experience. I honestly think I went a little insane while I was dealing with them. We are in a duplex. And I hear my neighbor vacuum at the most random of hours. I can't help but think she's trying to fight bedbugs, too. I can't force them to treat or even inspect the neighbor. The laws here don't require it. Also, there already *was* a month between treatments. We've been treated twice, the 2nd treatment included chemicals. I'm seriously hoping we're DONE. But we're watching the kids like hawks for new bites. As a truck driver's wife, I am paranoid about getting bedbugs. Especially when my husband went to truck driving school and was stuck in a very bad motel. At least I know there are a couple of non-chemical ways to fight them. I've also heard of exterminators using extreme cold to treat. I dealt with these critters once too... Ugh! No fun! My office is battling them. They did heat and chemicals and had us pack our entire cubicles abd bring everything home...or in my case to the trunk of my car. This blog made me your crazy follower. I am deeply impressed by your work and therefore adding you in my favorite list so that next time I could read you again. I am thankful to you because your article is very helpful for me to carry on with my research in the area Cockroach Control in Romford. Your quoted examples are relevant to my research as well.